Summary: Documenting the cross-disciplinary literacy activities supported by a partnership between teacher-researchers and a local art museum, this excellent resource offers both activities and practical strategies for taking writing about art into the classroom using resources from local art galleries and online virtual art museums. We sought to mitigate the disconnect of cultural expectations between our art museum and the schools it serves. In this article, we bring into focus an innovative museum-school partnership grounded in shared expertise. In doing so, we explore and make visible the ways learners across an experience, age, and professional spectrum learn to see learning in order to conceive of, navigate across, interact with, and learn from the communities in which they share membership. 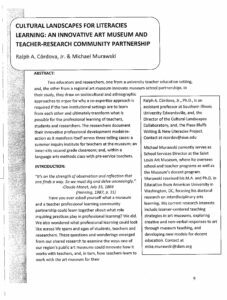 This museum-school based partnership is a model-in-action that grew out of the Cultural Landscapes Collaboratory (Cordova & Matthiesen, 2010), a multi-professional community of learners (described later). We argue that all members—despite age and institutional affiliation—possess funds of knowledge (Moll, 1994; Moll, Amanti, Neff, & Gonzalez, 1992) that ground the literate ways that shape how they access and make sense of the spaces they navigate. When we take time to learn to see learning, or the ways members conceive of learning, we develop a shared vision for new potentials and innovative ways to be with new cultural spaces in powerfully transformative ways.